We all had a good nights sleep last night and even Kouta settled down in the kitchen (we smuggled him in again!). So he was ready for the ride today but first he wanted to go a hunting - he was fascinated by these Bush Bustards that kept roaming around the campground! If you can't see the bird it is in the top left corner and as you can see Kouta is getting ready to run! We left our honeymoon suite at Millaa Millaa campground and everything is dry. We knew we would have 3 climbs before a longish down hill - so there was a short climb out of Millaa Millaa itself and another climb about 5km along. At the 8km mark you descend down to around 500m above sea level on a very steep descent (10%) and trucks are warned to descend down in low gears but most don't bother! It is hard on the brakes with the bike and your hands are hurting like hell from squeezing the levers! The down hill is around 5km long and you don't get to see much of the scenery for watching the road in front of you! Although we had a shoulder it was generally covered in a thin layer of mud and had green moss in it - the results of the roads not drying out and constant rain!!! At the bottom of the hill you immediately start on a 3km 8% climb - I thought that I might not make it but we both felt comfortable riding it - not too sure if we could do the 10%! The above photo is taken on the flatter part of the 8% climb up and you can see Neil. At 16km you reach the top and there is a little scenic drive that is all over grown that you can take but we pulled in there for a small break and to take photos of something which we have never come across but is an excellent idea - they are animal (ie. possum, tree kangaroos, bandicoots etc) crossings! they swing across the road for a tree to a pole and if you look around the road there are no dead animals - so I assume they are used! Neat aye! From the 16km mark you begin to go down, but the down hill is not exactly coasting - it is a series of 8% drops so you have to take it slowly and brake alot. Some drops were 1.5km and others were 4km long and this continues to Henrietta creek which is at 23km from Millaa Millaa and from there you undulate up and down all the way to Innisfail. Along the way there are lots of walking tracks and there was one look out and it gave a stunning view of the Johnstone River. While we were taking the photo we came across this huge butterfly fluttering about and it was about the size of my hand and it wouldn't land to take a photo so Neil just pointed the camera and took photos as it flittered about - so the photo is a little blurry! sorry it isn't clear enough but it just wouldn't sit still! Once in the valley the road becomes more rolling and the prevailing wind for here is a south easterly so we had it as a head wind and lately it has been strong so on some downhills we were actually pedalling! This coming weekend Innisfail is meant to have very strong winds - Saturday 35km per hour and Sunday reaching 40km per hour so it would be a good idea to go from Innisfail to Millaa Millaa on these days as the wind will definitely help you up the 10% hills! Just before you get to Innisfail there is a suburb called O'Briens Hill so naturally I had to get my photo taken! As you can see it is not raining - the other week when we came through Innisfail is was absolutely pouring with rain and even 15 years ago when I came through it was pouring with rain and even Neil thinks this is the first time he has come through Innisfail and it isn't raining!!! So I was relieved to get to the campground and have a hot shower to get rid of all the road crap (I don't know how it got on me!) and sweat - you certainly notice the temperature and humidity now we are at sea level - it is about 25 degrees and humid! but I shall not complain because it isn't raining!!! I am tired and shall sleep well tonight - although we came down hill today the up hills were tough and even the down hills were challenging but it took us 4 hours cycling to got 65km and you may think that isn't bad but when you consider we descended nearly 1000m it is slow!!! 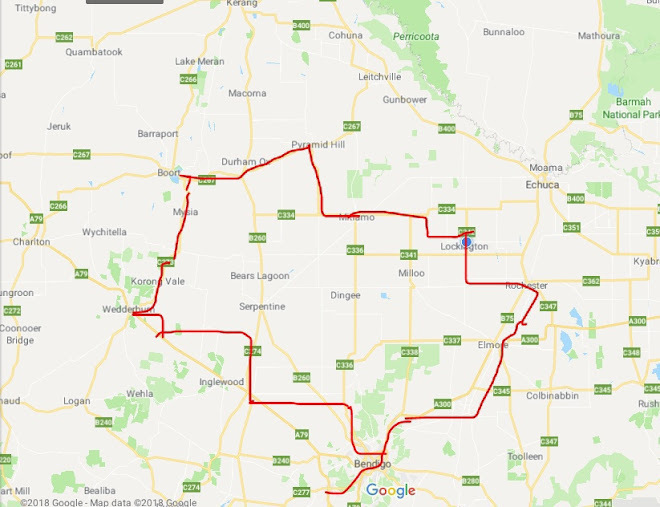 Tomorrow we will make Bilyanna Rest Area which is 20km south of Tully as we need to get out of this area by the weekend to avoid the shocking wind that is meant to be coming and also to get out of the rain area!